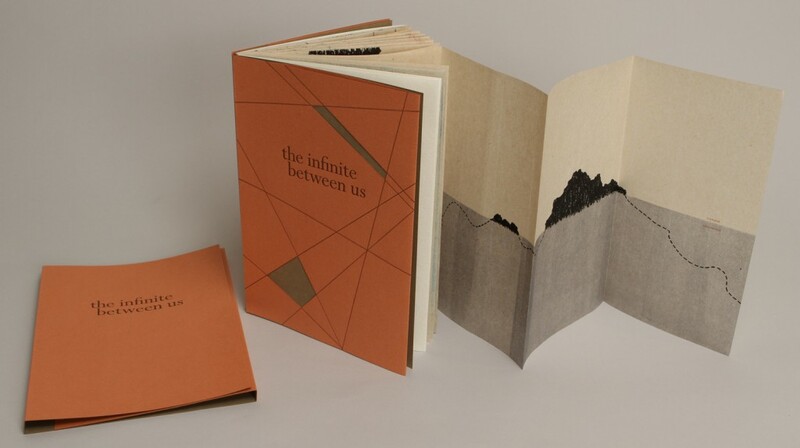 This image shows the book standing with its letterpress printed 2-ply laminated Bugra tri-fold protective cover. 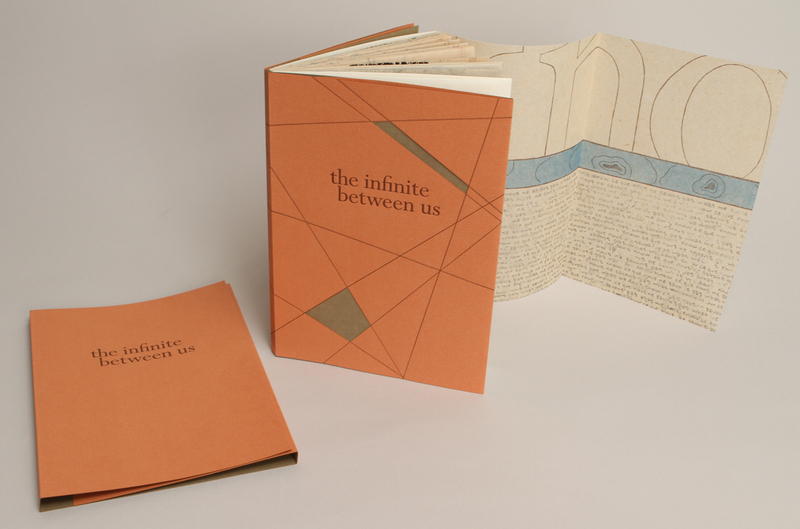 The actual cover of the book is single ply Bugra that is letterpress printed with hand-cut outs. One of the many foldouts from this book is displayed here, this one includes printing from photopolymer plates made from scratch negatives and from handwriting that has been erased and scanned with its erasure bits. The letterpress printed title page is flanked by this quote by Edmond Jabes – it is preceded by the quote in French and followed by the quote in English. techniques. The metal type for most of the text is Perpetua and Perpetua Italic along with some ornaments. 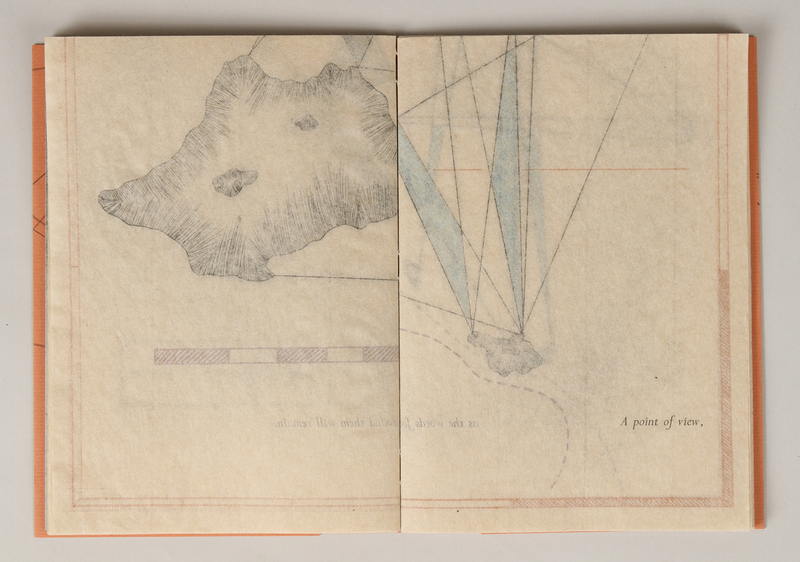 The juxtapositions between spreads are meant to represent layers of information over time. 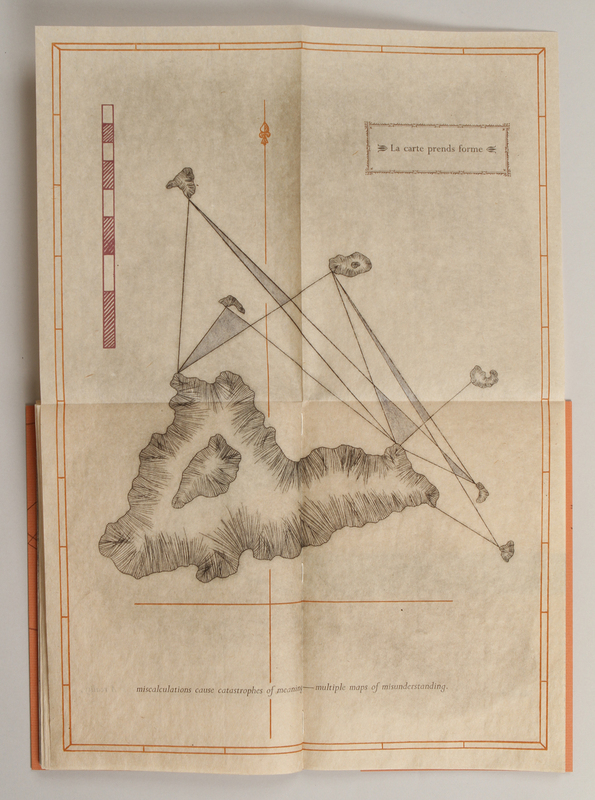 This is one of four map images that unfolds from the book. They are made using drypoint etching techniques, silkscreen, pochoir, and letterpress printing. 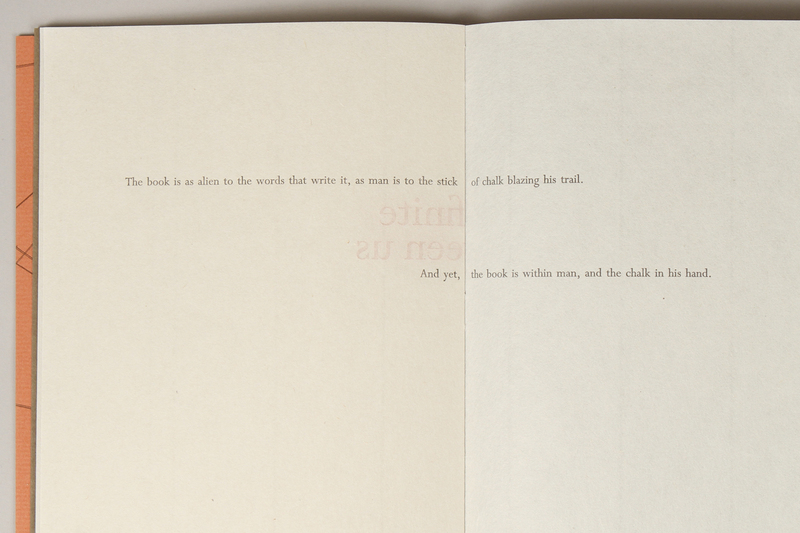 This image shows the book standing again with another foldout that includes silkscreen, monotype and letterpress printing. The depth of the ocean is shown here as representing an ineffable kind of space. voyage that ended in shipwreck after several years at sea, this book instead explores the aura around exploring the unknown. This project maps the spaces between the known and the unknown, between language and knowledge, and between the visual and the textual. I am interested in the book, its history and its potential. The book is a container for ideas, an object and a symbol that takes many different forms in many different cultures. Its job has been to store and impart information through the use of text, image, material, and structure. Not only is the book compelling as an object but it also involves concepts of language and communication that are intricate and complex. The book is an active space for people and concepts to reside in, and to move around in. It is not a stagnant place, but one that is in constant flux and re-evaluation. As our culture shifts the book shifts with it, or perhaps the book itself leads us in unexpected directions. Not only is the object shifting, the act of reading itself is shifting. Letter, word, image, page, structure — these elements can combine in such a plethora of enigmatic and evocative ways. I am also interested in the activated spaces that surround the book — the connections and circuits that link us as people to this object that has the potential to be a multi-media, multisensory and interdisciplinary experience. Although I am attracted to the history and the craft of the book, my interest is in taking the concept of the book in unexpected directions. As the traditional book loses more and more of its utilitarian function in our lives, it has turned into an important artistic form. It is this form of art that holds my attention and provides an arena for exploration and artistic expression.